What is trust, and why is it important in the workplace? 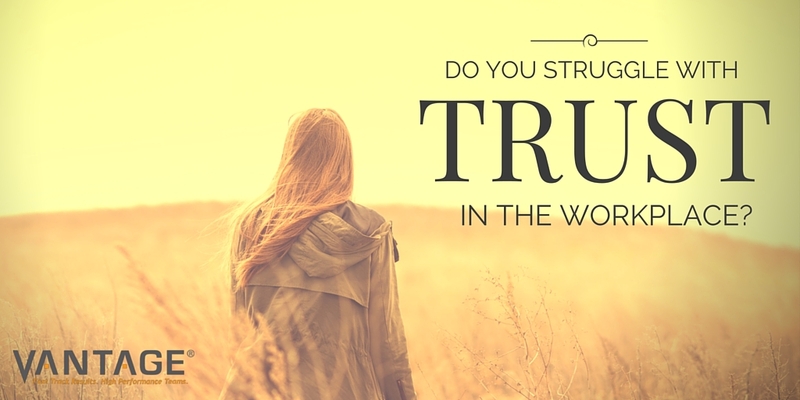 | The Vantage Group, Inc.
What is trust, and why is it important in the workplace? Trust (according to the Oxford English Dictionary) is the “firm belief in the reliability, truth, or ability of someone or something.” However, the definition of trust also needs to include the expectation of “ethically justifiable behavior” – that the person is trusted to do the right thing. But trust isn’t just a nice thing to have in a team or working relationship, it is central to effective organizational performance. Trust is often referred to as the foundation of what the rest of the team interactions are built on. It defines relationships between individuals and groups and is the cement that binds people together. Over the last two decades, organizations have been flattening their structures to remove unnecessary layers of management, developing team-working and empowering employees to take responsibility for their own performance. In doing this they have relied more and more on their social capital, moving from a rule-bound, authoritarian organization to one based on the commitment of employees to each other and the organization. So what happens when trust breaks down? Teams low on trust tend to fall apart whenever there is a challenge or difficulty. Members are unwilling to freely and candidly share their views or even information. Offline, they tend to dismiss other teammate’s competence or the value of the team. Even when there is apparent agreement in the room, the outcomes are dismissed, gossiped about, and not acted upon by the membership. This leads to a myriad of other dysfunctions within the team such as forming of cliques and factions, and no camaraderie. A low trust team is also ineffective in conducting meetings and struggles to go beyond discussing issues to deciding actions. And it doesn’t stop there. Low trust teams respond poorly to change, won’t take innovative risks, avoid debating important issues, avoid any form of conflict, treat communication as a low priority and don’t share a common vision and lack alignment on the team’s mission. Creating a high trust organization is the challenge faced by all leaders. Trust doesn’t just happen overnight, it requires an inter-related set of policies, such as promoting a relationship orientated culture, creating opportunities to meet informally and a day-to-day management of workplace competencies. On the other hand,inconsistent messages, inconsistent standards, not guarding the backs of your teammates, a failure to trust others, elephants in the room (some dramatic action that no one will discuss), rumors from the grapevine and consistent corporate underperformance all serve to reduce trust. So how do you measure trust in your team and take action? It is easy to ask people “Do you trust your manager?” but this is not a very reliable indicator of trust. Partly, this is due to the effect of personality on trust and partly due to people’s different definitions of trust. The gathering of this important information gives leadership insight into specific areas that may be having a negative effect on team performance. After measuring the critical dimensions of a high-performing team, the survey is intended to provide teams with a snapshot of how the collective members perceive the team to be performing along these dimensions. Although the discrete scores for each dimension can be telling, what is more important is taking collective and deliberate action to improve and enhance those dimensions called out through the scores. After working to improve the team’s interactions, the Team Performance Survey should be used to measure progress. A high trust team is critical to productivity, performance and effectiveness within an organization. Teams high on trust are flexible and resilient in the face of controversy and challenge because the members support each other and openly share their ideas, concerns, and beliefs in order to achieve the best possible outcome for the team. They know each other’s capabilities and count on each other to deliver. Agreements in the room are genuine and openly supported and acted upon by the team members. Is this the kind of team you want? If so, take the first step and request a Team Performance Survey today from The Vantage Group. Contact us today or call us at 616-676-3330 to find out more. Don’t Miss Out! Where Should We Send Your Email Updates? Are You Keeping Who You Hire? How Does Your Leadership Stack Up With Your Job Description?